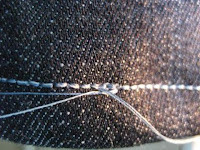 Sometimes the thread used in your jeans is not the gold thread I talked about last week. It is here that you have to get creative. 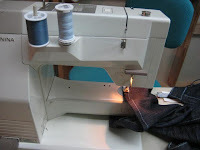 I took two spools of thread today and ran them both through my needle, using one of the same shade for the bobbin. 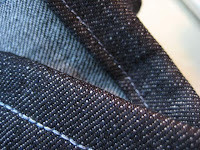 As you can see, the blend of the two was a really good match for the topstitching on these jeans. This last photo shows how it looks on both the inside and the outside. Help! The Vacuum Chewed my Bedspread!